At my local mega-grocery store last weekend, I happened to stroll down the aisle dedicated to homeopathic treatments. I saw shelf after shelf of brightly colored packages, all claiming health benefits. Most of these "medicines" were not cheap. Amazing. To an average shopper, all of these products look like real medicine. The packaging is similar, the claims are similar, and it's all on display at a respectable grocery store. The difference, though, is that none of these products do what they claim to do. Thanks to a special exception for homeopathy created all the way back in 1938, none of the claims on these medicines need to be tested. The homeopathy aisle is an organized, state-sanctioned scam. The 1938 law was the brain child of a U.S. senator, Royal Copeland, who happened to be a homeopath. Sen. Copeland inserted language into a major food and drug law that declared homeopathic preparations to be drugs. It also allowed homeopaths themselves to maintain the official list of these drugs, called the Homeopathic Pharmacopeia. Talk about the fox guarding the henhouse! Thanks to aggressive lobbying by homeopaths, homeopathic ingredients are not subject to the normal review required of real drugs. Most importantly, homeopathic drug makers do not have to prove their products are effective. Homeopathy is based on the long-discredited beliefs of Samuel Hahnemann 200 years ago. Hahnemann thought that "like cures like," as long as you dilute the substance sufficiently. Thus caffeine will cure sleeplessness, poison ivy extract will cure an itch, and paralyzing plant toxins will cure pain. None of this is true. The other key principle of homeopathy is that the more you dilute something, the stronger its effect. This is not only wrong, but it is exactly the opposite of what really happens. Greater dosage levels, unsurprisingly, have stronger effects. In Hahnemann's defense, science wasn't very far along when he came up with these notions. Real medicine moved on long ago. But homeopathy persists, because there is money to be made - lots of money. "Topricin's 11 homeopathic medicines are proven to be safe and effective for the elderly, pregnant, children, pregnant women and all skin types. 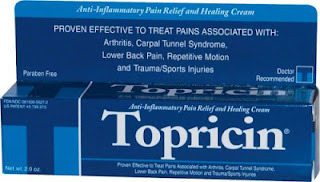 Experience Topricin's relief for damaged muscle, tendon, ligament, and nerve tissue." This is simply not true. It even seems to go beyond the bounds of what the (very weak) FDA regulations allow. The website specifically claims that Topricin is effective for arthritis, back pain, bruises, bursitis, fibromyalgia, minor burns, tendinitis, and more. Belladonna for pain? Belladonna is one of the most toxic plants known to man. Eating just a few small berries is lethal. And the one study I could find showed that it has no clinical effect when used in a homeopathic preparation. That's lucky for unwitting consumers: if it wasn't so diluted, Belladonna would make them very sick indeed. Heloderma? That's the venom from a gila monster. Although rarely fatal, it causes severe pain, bleeding, nausea, and vomiting. This is not something I would take for pain - and I certainly would never give it to children. I know that Big Pharma is often guilty of deceptive marketing, and I've criticized Pharma many times. But CAM ("complementary and alternative") pharma is every bit as bad. Big CAM takes advantage of generous laws to make medical claims with impunity, often skirting as close as possible to what the law permits. And the Big CAM companies profit handsomely in the process. 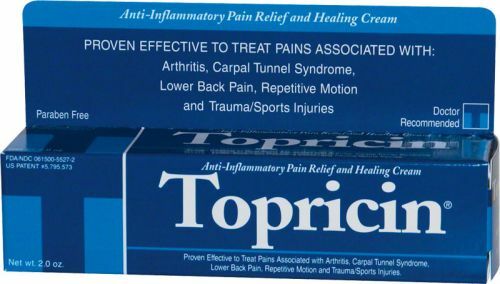 Everything on the Topricin package - the name, the packaging, the claims - is designed to make the consumer think that it is an effective pain treatment. It's not. It's a modern package of snake oil.